This article is cross-posted from the Social evolution forum where I occasionally write about issues in human evolution. 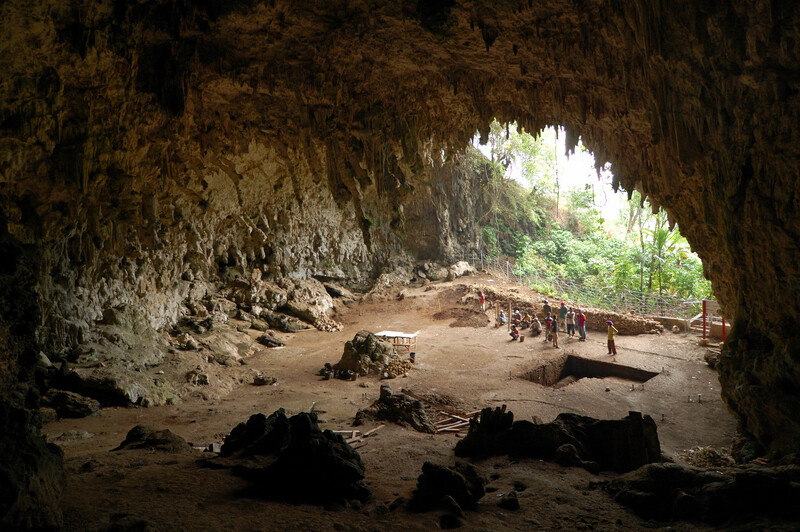 The original dates for H. floresiensis were based on the (then reasonable) assumption that the depositional sequence in one part of the cave was representative of other parts of the cave. But caves are very active geological systems, and it often turns out—as in this case—that stratigraphy isn’t uniform. When researchers excavated elsewhere in the Liang Bua cave, they found new stratigraphic details (erosion of older deposits followed by filling in of younger deposits) that prompted them to redate the sequence. These new data gave a range of 100-60,000 YBP for the skeletal remains of H. floresiensis and 190,000-50,000 for floresiensis-associated artifacts. The end of this date range—50,000 YBP—happens to be close to the estimated appearance time of modern H. sapiens on the island, which raises some intriguing questions. For those of you interested in a detailed analysis of the errors of the original dates, and a discussion of some still-unresolved issues with the paper, I highly recommend John Hawks’ post What the revised Liang Bua chronology leaves unanswered. Unfortunately, some in the media have gone beyond discussion of those questions and breathlessly reported that these new dates likely mean that our species wiped out the hobbits. While that hypothesis certainly remains a formal–and fascinating– possibility, it’s only one of several. It’s based simply on the observation that under the current chronology, approximately the same time modern humans got to Flores, we stop seeing hobbit tools in the deposits at Liang Bua. So as of right now, we actually don’t know that humans killed off (either directly or indirectly) hobbits. But this is probably the interpretation that the interested public has walked away with after this week. Call me conservative, but I’m a bit uncomfortable that our speculation might have given people the impression of greater certainty than we actually have. There are two other aspects of this new finding that interest me. The first is the implication that these older dates have for the debate over whether H. floresiensis was a pathological modern H. sapiens or a separate species with distinctive morphology, likely caused by insular dwarfism. The older date range for these fossils suggests that H. floresiensis was indeed a separate species. Furthermore, as Kristina Kilgrove discusses, these new dates also undermine cryptozoological interpretations of the Indonesian legend of Ebu Gogo as deriving from sustained interactions between humans and H. floresiensis as recently as 12,000 years ago. The second aspect of these new dates that I find interesting is that although they mean that the hobbits were older than we initially thought, they still fall within the range of time in which it’s possible to obtain ancient DNA from skeletal remains. I have no idea whether there will be further attempts to extract aDNA from the hobbits (previous attempts were unsuccessful), but I continue to be hopeful that someday we will have hobbit DNA. If H. floresiensis is, as some suspect, a descendant of H. erectus, then their genomes could give us a glimpse of that species’ genetic diversity and help us better understand the evolutionary history of ourselves, Neanderthals, and Denisovans. I never get tired of stuff from the Things You Never Thought You’d Hear Department: ” . . . but I continue to be hopeful that someday we will have hobbit DNA.” ! I know you mean for the genome info, not the idea of having your own pet hobbit . . . .